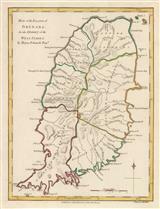 Description: A stunning and elegant map of the Island with beautiful original colouring. Description: Grenada. Published for the History of the West Indies. Coloured.